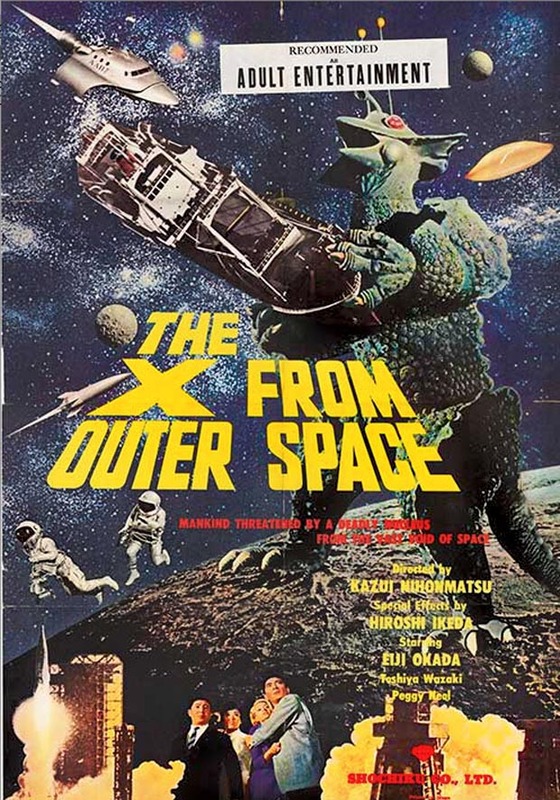 Released originally in Japan in 1967 (and then in USA in 1968) film studio Shochiku created a uniquely entertaining and lovable alien monster (the X From Outer Space) invasion movie in which space explorers bring back to earth a dangerous, enormous galactic creature that teaches them al a few lessons about life. The film has an earnest goofiness to it which outstrips the deficiencies of the story itself. The space craft AAB Gamma is a marionette (as is much else in the film) which encounters a baffling UFO phenomenon in the vicinity of Mars. This is an ongoing problem which has sabotaged earlier efforts by the FAFC space agency (which is run from a location in which scenic shots of Mount Fuji are always in background, which is incidentally the logo icon of the movie studio Shochiku). When the hand-picked crew of AAB Gamma encounters the mysterious UFO, it literally looks like a chicken pot pie with inner glowing lights that taunt the earthling craft with superior swooping speed (in the unmistakable arc of a marionette being rapidly swung across the screen on wires, which may seem familair to sci-fi film fans: it happens in a similar way with much less skill in Ed Wood's famous Plan 9 from Outer Space). Then "space spores" (they look like crystalline eggs) are left behind on the superstructure of AAB Gamma after the encounter with the intergalactic pot pie. Back on earth, the eggs produce a 20-story tall super-'chicken' with red eyes and reptile skin. This monster has a horrible opinion of modern Tokyo architecture, and immediately goes on a rampaging critique that levels everything in his path. An arsenal of toy tanks and missile launchers are deployed to stop the chicken (it may be a distant relative of the equally horrifying space buzzard from The Giant Claw of 1957) but the toy arsenal have no effect beyond a spectacular fireworks show featuring multi-colored explosion clouds. Overcoming all opposition, the monster marches onward with a wobbling gate and rubbery feet vibrating on camera. Guilala (the name of our fearsome chicken) eventually begins destroying nuclear power plants, the energy released is then absorbed making Guilala more powerful than ever, but with a new talent which is to physically change into a glowing spherical ball which then travels around the countryside (a nearly identical mode of transportation used by Glenda the Good Witch in Wizard of Oz). "Guilala taught me an important lesson. Thanks to him I now realize that there's somebody else who loves Sano with all her heart." How did Guilala do this? And why is there a loving affection by the cast for Guilala despite having flattened Toyko and terrified it's citizenry with its zany powers? In the end, the tale seems to teach that it's hard to not love a giant reptile chicken. The music by Taku Izumi is repetitious but a perfectly strange companion to the oddness of the filmed tale. The film direction by Kazui Nihonmatsu battles a problem of limited movie sets, though he makes the best of things, with an offscreen trampoline, for example, obviously working as the gravity-free special effect for the moon base scenes. Story-telling is direct and there's never any doubt about what is happening onscreen, as bizarre as it may be. The sum total of the movie is a one-of-a-kind Japanese monster movie, which (depending upon the sentiments of a viewer) rises to the level of a delightfully entertaining and demented tale of outer space disaster that is full of surprises, or is a botched and child-like sci-fi monster tale hampered by uneven special effects and puzzling methods of expression.